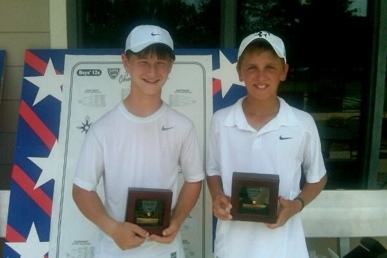 Nathan Ponwith (right in picture) added to his steadily growing trophy case with yet another impressive effort at the USTA National Championships Boys’ 12s in Little Rock, Ark., bringing home a silver ball in singles and a gold ball in doubles. The effort came on the heels of Ponwith’s run at the USTA Boys National Clay Court Championships, July 18-25, where he finished with the exact same silver-gold results. The 12-year-old Ponwith came into the hard court event at Little Rock’s Burns Park Tennis Center as the No. 4 seed in singles. En route to the final in singles, Ponwith cruised through six matches without even dropping a set, losing just 28 games in that span. That also included victories three seeded players, No. 17 Mitchell Ostrovky (Brooklyn, N.Y.), No. 9 Noah Schachter and No. 17 Jay Min (Stellacoom, Wash.). The singles run came to an end in the finals against No. 3 seed Robert Levine of Bedford, N.Y., falling 6-3, 6-2. Ponwith did prove triumphant in doubles, partnering with Kyle Seelig (Hartford, Penn.) to defeat No. 2 seeded William Blumberg (Greenwich, Conn.) and Levine, 6-4. 6-2. The third-seeded Ponwith-Seelig did not drop a set in any of their six matches. For complete results from the Boys 12s National Championships, click HERE. After the tournament in Arkansas, Ponwith made a beeline straight to Montreal, Canada to be a part of the United States team at the Le Blanc Cup, a top international competition for 12-and-under players. Ponwith, who won’t age out of the 12-and-under division until April of next year, is currently the No. 1 ranked junior in the USTA Southwest in that age group, and ranked No. 4 in that division nationally. That ranking is bound to improve upon when updated 12s rankings are published later this week to include the National Championships. Other impressive USTA Southwest results during National Championships week included Haley Driver (Scottsdale, Ariz.) who reached the Round of 32 in Singles and Doubles at the Girls 18s in San Diego, and Nicolas Montoya (Scottsdale, Ariz.) who reached the Round of 32 in singles and doubles (with Tempe’s Alex Lawson) at the Boys’ 16s in Kalamazoo, Mich. Boys and Girls 18s winners at the National Championships included Jack Sock (Lincoln, Neb.) and Shelby Rogers (Daniel Island, S.C.). Both Sock and Rogers will receive main draw entry into the 2010 US Open as a result of their victories.